Starting in the August of 2016 I started as the program manager and designer for "U Bring Change to Mind," the college division of a national non-profit. U Bring Change to Mind’s mission is to eliminate the stigma associated with mental illness on college campuses. Through fun awareness activities and a spirit of inclusion and education, U Bring Change to Mind(UBC2M) targets both local and national change, and both individual and institutional change. By emphasizing “connectedness” we can change attitudes, generate social support, and put pressure on administrators to improve services, in order to eliminate barriers to care and to fulfill lives. During my time with UBC2M I wore many different hats and was responsible for a large number of roles in the creation of the program. I was responsible for all the graphic design needs for the program—designing websites, branding, and the materials for "The College Toolbox," a set of resources students to launch their own chapter. I was responsible not only for running the pilot program, but also the long-term development of the program and its structure as it prepared for a national-rollout across college campuses. I served as the academic advisor for the pilot program's student chapter. I helped the students plan events and activities that helped educated about mental health stigma on campus. Developing the branding for the college program was a nuanced task. 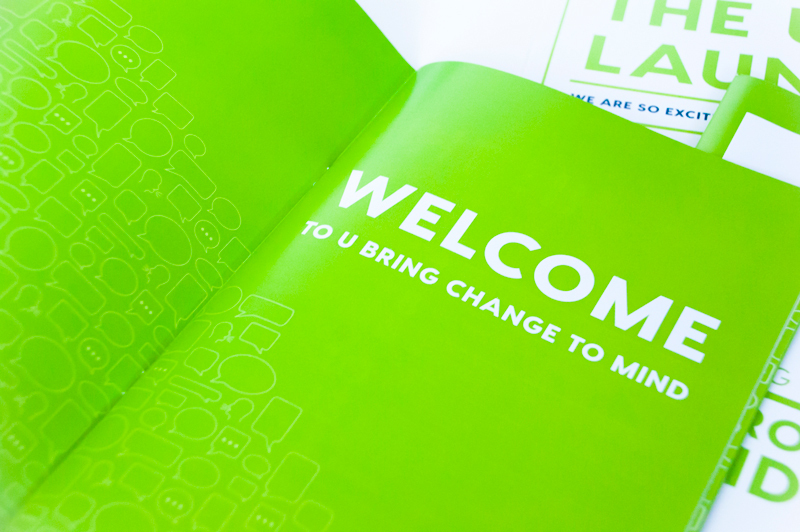 The brand had to work alongside the Bring Change to Mind national branding, but had to have its own brand image that would apply solely to the college program and its materials. I chose to make the "U" like a varsity letter and to serve as the visual identifier of the college program brand. From the logo development, I created a youthful and versatile color palette and pattern illustrations that could be used to accent our visuals. The set of resources I created for the U Bring Change to Mind program is called “The College Toolbox.” The toolbox includes all the information necessary to work as a U Bring Change to Mind chapter and to further the mission of creating stigma-free campuses. These pieces ensure that information is easily communicated, used and understood. By carefully designing the components, my goal was to make the concept behind the program more straightforward and foster successful adoption. As the Program Manager, I developed the concept for "The College Toolbox," wrote the copy, and designed each piece. These pieces included a "Launch Guide," an program guidebook, mentor guide, a branding guide, and over 15 event booklets. When working as the advisor to the Indiana University student chapter, I helped design t-shirts and marketing materials for a variety of events and campaigns. These designs for event materials, will also be included as digital resources for the College Toolbox.